You Haven’t Seen This RJ31x Jack Wiring & Use on Buzzfeed. Surprised? We were too. After all, everyone wants to know about rj31x jack wiring, right? Rj31x jack wiring is a little unusual. The RJ31x jack is used for wiring an alarm system into your phone line. Its purpose is to allow the alarm system to seize the line and dial out even when the phone is off the hook. It’s basically a relay that shorts two lines together when the alarm system is not being used allowing the phones to operate normally. When the alarm system is tripped it seizes the line by breaking the connection between the two lines and disconnecting the normal phone lines. For our discussion, we will assume a Comcast Arris phone modem . The principle applies to other phone inputs. You just need to get R1 & T1 connected to Line 1 ( blue pair). Line 1 will connect to line 2 unless the relay is tripped by an alarm system. Note: Your patch panel may already have an RJ31x jack and save you the trouble of wiring one up. Wiring the CAT-5 cable is a bit tricky since you have to wire the 1st line (blue pair) into the relay and wire the 2nd line (orange pair) out. It also seems a little strange to have one cable supporting both the input line and the output line. Imagine that you are just connecting two separate wires and then combining them both into a single cable. Carefully strip off the outer insulation somewhere in the middle of the cable & give yourself enough room to reach the phone system on one end, the phone input (blue pair – line 1) in the middle and the RJ31x jack on the other. Cut the blue pair (line 1) so that it no longer makes the connection out to the phone system. We will make the connection out to the phone system with Line 2 (orange pair). Note: we don’t have to worry about cutting the 2nd line orange pair since we won’t bother wiring it into our RJ11 plug. 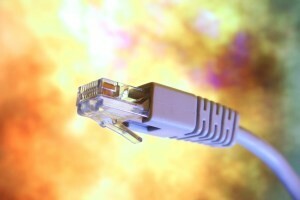 If you are using an existing cable were the 2nd line is connected, you should break this connection or use another line. For our purpose we will assume you are using CAT 5 cable but it really doesn’t matter which cable you use: CAT 5, CAT 5E, CAT 6. We are using CAT 5 for the 2 pairs of wire rather than running 2 separate wires. The relay will short the tips of the 2 lines together. It also shorts the rings of the 2 lines together in the non-energized state making the connection to allow line 2 (orange pair) to connect to the phone system. Whenever the alarm wants to seize the line it trips the relay and breaks the connection to the house phones. As a test check for continuity between the BLU/WHT & ORG/WHT wires (R1 – pin 4, R2 – pin 1). Likewise, check continuity between WHT/BLU & WHT/ORG (T1 – pin 5, T2 – pin 8). It’s always good to check between tip & ring to make sure you don’t have a short. The input to the RJ31x jack comes from the phone line so you need the Blue pair to connect directly to the CAT 5 cable. 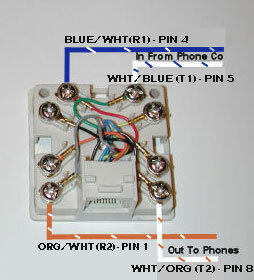 Getting the input from the Arris Comcast modem requires the blue pair to connect into the RJ11 jack – pins 3 (R1 – BLU/WHT) & 4 (T1 – WHT/BLU). You will have to use a crimp tool to accomplish that. Check continuity from pin 3 (R1) to your RJ31x jack. Also, check continuity to pin 4 (T1) to your RJ31x jack. If you have your RJ31x wired properly pin 3 (R1) will now be connected all the way through to the ORG/WHT (R2). Likewise, pin 4 (T1) will now be connected all the way through to the WHT/ORG (T2). Since we are using the orange pair (line 2) as the output of RJ31x jack, this will be our phone lines. If your phone system is connected to a jack or patch panel make sure you wire the orange pair as you would normally wire line 1 (blue pair). Test the system by connecting a phone or test set. If nothing else, you can connect a jack and plug in a hand set. You should have a dial tone and be able to make and receive calls. If not go back and check your wiring making sure you can get a dial tone from the phone input 1st. Working with rj31x jack wiring may not be glamourous but it helps to have a schematic and general understanding of the connections. i have to admit that of all of the places I found online yours is the best of two. The other seems to have responsibility issues. The information presented here is useful and could be applied by anyone. who made the RJ-31X that you show there in the photo? I got the physical jack from Home Depot at the end of 2014. I took a picture with my phone and edited in Photoshop.